Winged Migraine: Art O'Sullivan's favored flock in Soquel Creek, 1991. There are times when I wonder if my creator might be messing with my mind on purpose. Take for instance the day I was finishing up an article called "50 Reasons to Vote for John Kerry" for Metro Santa Cruz. I turned on the evening news expecting politics as usual, only to witness a sickening spectacle: gun-toting, camouflage-clad John Kerry and three companions out on a photo-op hunt in the cornfields of the crucial swing state of Ohio. There they were, stalking geese and blasting the majestic birds from the sky to demonstrate that John Kerry is a regular guy. Kerry and party held up four hanging, drooping bird carcasses for the cameras. Sen. Kerry literally had blood on his hands--very presidential. "We each got one," he told the media. Suddenly I wondered whether I would be able to finish writing my list of reasons to vote for him. Sure, I already knew Kerry hunts--but these particular bullets cut straight through my heart. It was back in April 1991 when I moved into the second-story, cavelike apartment over a noisy restaurant on the Esplanade next to the ocean, the beach and Soquel Creek in Capitola Village. Ron Fredericks, my new landlord, pitched in and carried some boxes upstairs for me. I stood gaping through the huge picture window that gave me the creek, the beach, the bay and the mountains over on the Monterey side. I walked up to the window and looked down, beyond the restaurant deck, to the little crescent-shaped beach next to the creek. There I saw for the first time two large brown, black and white birds and one, two, three, four, five furry little yellow chicks, cheeping and chasing scraps of restaurant food. Excited, I called Ron over to the window. "Look at the swans!" I urged. The birds walked up and down the little beach, nibbling at tidbits tossed or lost by diners on the deck. Then the bird family took to the water, parents flanking the babies who, despite their diminutive size and newness to the world, swam with courage and pride out into the middle of the creek, turning upstream and disappearing under the bridge. I never planned to get attached to a family of semiwild geese. It just happened. My birds had picked a safe enough spot to hang out, considering how close they were to civilization. The only access to the beach by land was the fenced deck of the restaurant, and it was the rare inebriate who ever attempted to jump from there over the fence and down the wall to the beach. That curved strip of sand was tucked between the outside of a bend in the creek and the restaurant's creekside wall, making this place seem like a snug and secure little spot for a very young family of geese to forage and shelter. Yet while essentially protected on the land side, they were potentially vulnerable if approached by water. And apparently, from winter to spring, these geese would lose their ability to fly. I found out that, until recently, there had been a couple of dozen geese in the neighborhood. A local man told me that shortly before my arrival in Capitola Village, the city government, blaming geese defecation for creek pollution, had contracted to round up and remove all geese from Soquel Creek. According to that eyewitness, contractors with nets and dogs had roughly nabbed all the seasonally flightless geese except two. Those two birds--one male and one female--were just too quick, avoiding the nets and outrunning the dogs, escaping on the creek and avoiding deportation. Right after the roundup, my observer noted with a chuckle, those two surviving geese had produced a bunch of babies. Which is about when I arrived. Late at night, the only sound in the village was the crashing of the ocean waves on the big beach. Then the adult geese's potent, squeaky honking sounds would cut through the ocean din, as the birds worked their way along the creek and into my dreams. My efforts to limit my feelings for the geese collapsed. I gave them names. Calling a living bird "Mother Goose" was out of the question, so I called them Mama Goose and Papa Goose. The three surviving goslings--you remember Donald Duck's nephews, Huey, Dewey and Louie? Well, I called these three Huey, Dewey and Louis Gossett Jr.--that was the white one. Later, the white one developed a thin neck, which indicates female, so she became Louise. I watched Mama Goose teaching her kids to fly--you run and flap your wings like this-- while one-legged Papa Goose stood a solitary watch. I used to feed him often, especially as he got too weak to forage with the rest of the family. Whenever Papa Goose saw me coming, he'd flap his great wings excitedly and allow me to approach. If I didn't produce food, he'd lower his head to the sand and make grazing motions, then raise his head expectantly. Sometimes he repeated these steps to make sure I got the message. I always ended up bringing him food. Not everyone understood our relationship. "Oh, look, a goose!" exclaimed a woman with a British accent on emerging from a restaurant one evening. "Is his name Christmas or Thanksgiving?" "It's Mister," I growled. My bird's real name was none of her business. Christmastime 1991, Papa Goose died. Heartbroken, I promised to watch out for his family. That family continued to change--notably with the arrival of an unrelated, larger and flightless white goose that attached herself to the reluctant family of geese. They eventually accepted her. Winter '92 saw a new dominant male on the block. Grown-up Huey drove Dewey away forever, then took to thrashing seagulls. Several times, I found myself physically breaking up fights between that goose and hapless gulls--the latter usually sustaining serious injuries. This was around the time I got to know Molly "the bird lady." Inspired by their granddaughters' concern for baby wild creatures, Molly and her husband Nathan had started Native Animal Rescue (NAR). The all-volunteer organization survived on donated funds, with veterinarians donating their services. (Wild birds and animals are notorious for not having money or insurance.) The people at NAR waged a relentless, desperate campaign to save injured, sick and orphaned wildlife, rehabilitating and returning them to their natural habitat whenever possible. In the years I lived at the beach, I spotted way too many pelicans and seagulls caught on fishing lines. I always freaked out, then called Native Animal Rescue, who always sent someone right over. I found their work inspirational. On St. Patrick's Day 1993, I arrived home around nightfall. The previous night I had finally made the trip over to Native Animal Rescue to see firsthand how they care for injured wildlife. It was just about dark when I walked into my apartment. Glancing out the picture window, I saw a pair of wings flapping on the creek. A goose was floundering around in the water next to a small tree that had recently washed downstream and gotten stuck in the shallow water. One of my birds was somehow trapped. I hurried back outside, down the alley, over the fence and down the wall to the little beach below my building. A brown goose was caught on the half-submerged tree. The other three geese were floating nearby--well, a safe distance away, farther out in the stream. The trapped bird was Mama Goose--my favorite. She must have been grazing in the water around the tree, and her head got stuck in the branches. Flapping her wings furiously wasn't helping--she was really trapped. The other geese hung by, more whimpering than honking. I had to save her. I had never waded more than a few feet out into Soquel Creek, and this tree was about 20 feet out in the water. I thought of calling NAR, but there was no time. As I approached the water's edge, Mama Goose, who had been lying motionlessly, began flapping her wings again, as though I represented danger. "I'm going to help you," I called to her as I stepped into the cold, murky water. The goose stopped moving. By now, night had set in and it was pretty dark out on the creek, but as I drew close to the tree where the bird was stuck, I could see that her head was underwater. There was no movement. Standing in water up to my thighs, I reached out and stroked the bird's neck. The feathers were cold. For an awful moment, I thought the goose was dead. Then her head rose out of the water, her long neck evidently still wedged between tree limbs below the water line. This smart old bird had run out of tricks. Like photos I'd seen of wildlife in traps, her eyes seemed to be asking me, "Is this the end?" She did not struggle any more. In the darkness, I grasped the two thickest limbs sticking up out of the water and pulled them apart. The bird remained trapped and motionless. Then I seized a smaller limb next to one of the larger ones and pulled those two apart. The goose's head slipped down into the dark water, then re-emerged. A bunch of her neck feathers looked crumpled, and for a second I wondered if she was injured. But then the goose let out two triumphal honks and shot away on the water, paddling rapidly with her wings and creating a wake like a speedboat, accompanied by a chorus of geese honking, celebrating her escape. As Mama Goose joined her family, I could see her silhouette offset by a streetlight across the creek. Her beautifully curving neck was intact--she'd simply had her feathers ruffled. After a moment, the four geese began their gentle glide upstream, as though nothing had happened. That autumn, I moved up to the third floor, farther from the action along the creek, and took less of an interest in the geese. Oh, they were there, they were fine, they honked, they grazed. It was just before sunset on a balmy Saturday in February 1998, a welcome respite from El Nino storms. The largely male crowd on the restaurant deck two stories below erupted into whoops and sustained cheering, as though the 49ers were winning the Superbowl--but football season was over. So I ran out onto my deck and peered over the railing and down to the creek just in time to see a big back Labrador retriever bearing down on a brown goose. Again, these birds could not fly in February. The tequila-soaked guys on the restaurant deck seemed to be rooting for the dog. Mama Goose was squawking and paddling for dear life, but the dog's jaws were literally on her tail as they splashed past the corner of the restaurant next door and disappeared. "Oh, my God!" I gasped as I bolted for the door. Dodging strolling visitors, I ran to the far end of the Esplanade, near where the creek flows into the bay, but saw no sign of goose or dog along the banks. The restaurant next door to mine had a wall of logs piled horizontally along the edge of the creek with a gate, and beach beneath. I had often seen the geese go back there. The gate was unhinged and I walked in. The two white geese honked. A gray-haired man stood grimly. "Where's the other bird?" I demanded. He pointed toward the inner recesses of the sandy ground that secured the building's foundations. Mama Goose stared out at me as she stumbled uncertainly in the shadows. A long streak of blood curved along her lower belly. "Oh my God!" I said again. "Where's the dog?" "Down there." He gestured toward the mouth of the creek. I ran to get help and something to wrap the goose in. The man stayed to keep watch in case the dog came back. At the top of my stairs I encountered my next-door neighbor, Rob. Nice guy--never knew him very well. But he offered to help. "Maybe a ride," I suggested. Rob descended the stairs while I went inside and called Native Animal Rescue. Busy. Next I phoned my animal-advocate friend Betsy Jones, and left a frantic message on her answering machine. Finally I got through to NAR. My neighbor came back up the stairs, carrying something wrapped in a jacket, drooping in his arms. The goose was alive. She had hissed at him but not resisted when he gathered her up in his jacket, which was now red with her blood. Rob's girlfriend Miranda offered to drive and I asked to go along. These were folks I'd always greeted but never done anything with. Yet, here we were. Rob kept the injured bird in his jacket on his lap. From the back seat, I advocated strongly for taking her to NAR, but was outvoted by the driver, who instead delivered us to a local veterinary hospital. We handed the bird over to hospital staff and waited. Finally, someone came and told us that the goose was seriously injured, and that they would do what they could for her. By the time I got home, Betsy had called back. That night, we visited the hospital. The goose squawked as they brought her in. My bird's tail feathers were all gone, removed to reach her wounds; and the skin was all chewed up by dog bites. I couldn't look while the veterinarian, Dr. Tammy Abraham, pointed out the goose's specific injuries to Betsy. I looked Mama Goose in the eye and reassured her she would be OK.
Back at home, I fed the remaining geese and told them that their family member had been hurt but she would be coming back. I doubted that they understood. At night I heard them calling out, searching for their absent companion. The folks at the hospital treated the goose's wounds and put her on intravenous antibiotics for the infection. Her wounds were healing. Over the next couple of weeks, I phoned the clinic several times and asked about the bird's condition. One evening I called, identified myself and asked the woman on the switchboard, "How is Mabel the goose doing?" "We have a goose staying here?" Apparently that was highly unusual for this dog-and-cat hospital. As it happened, a former NAR volunteer with bird expertise, Melanie Dominguez, had been on duty at the vet when we brought the wounded bird in. On hearing the news, Melanie reacted, "Oh, good--I get to work with a goose!" The hospital staff named the goose "Mabel"--which, as her self-appointed guardian, I knew was incorrect, but a reassuring sign of their good intentions. Melanie told me how "Mabel" would vacate her gated space so Melanie could clean it; then, when the cleaning was done, the goose would return to her pen on cue. Then I got a phone message: "Your goose is doing fine." But then a clinic staff member not closely involved with the case informed me that the goose might be placed permanently in a sanctuary--away from her family. Alarmed, I called Molly at NAR. "They can't do that," she said firmly--like someone who knew her wildlife protocol. After two weeks, a transfer of the patient to Native Animal Rescue was arranged. Despite the fact that Molly's home/facility was already overflowing with baby chicks at the time, she set up a space in her backyard where the goose could walk around. It was important to keep her out of water until her wounds had healed and feathers were growing back, since bird poop in the water could cause new infection. The goose spent the nights in the garage, in a sky kennel with plastic covering with air holes that kept her warm. Late at night, I kept thinking of Mama Goose in rehabilitation. I lay in bed, praying for her safe return. The two surviving white female geese still called out in the darkness, but got no answer. Betsy told me she'd dreamed that she saw me carrying the recovered goose back to the creek, hurrying--I couldn't wait--until I got close enough to let the bird go; then she flew away on her own. I told Molly about my friend's dream, and Molly said she would make sure that I could be present for the bird's release. On March 22, Molly told me the goose looked "really good," but should remain at NAR until the storms were over. Four days later, it was a sunny, breezy Wednesday morning, though dark clouds on the horizon promised more rain. Nathan, Molly's husband, called around 11 to say it was time to release the goose. My heart leaped in fear and anticipation. "Are you sure she's ready?" Nathan said the goose was very unhappy in her current surroundings, but was otherwise doing well, and it was a beautiful day. I suggested we meet across the creek, just over the bridge, on the adjacent beach where the geese often grazed and sat. When I arrived 20 minutes later, I discovered Nathan and granddaughters Zoe and Lupen had preceded me to the spot and were standing by a dog crate on the edge of the beach, just waiting for me. Looking upstream through the semicircular arch of the bridge, I could see the two white geese grazing lightly, heads dipping down into the sparkling water, silhouetted and half-framed by the rounded underside of the bridge. The brown goose's crate faced a different direction, across the creek toward the restaurants. Nathan asked me, "Should we release her now?" Nathan lifted the gate on the crate. "There you go," he told the bird. The goose hesitated. After 3 1/2 weeks of confinement, her life ruled by people, now she stood on the threshold of her old home. Then Mama Goose stuck her long neck out of the box and began to screech. She hollered like I'd never heard her before. Her tongue fluttered as she screamed with all her heart--calling to her family, I was sure--while she still hesitated to step out. 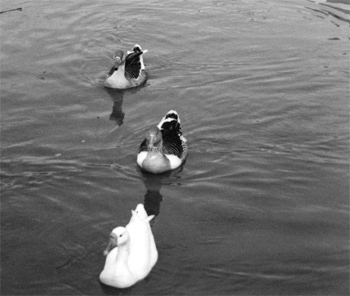 Upstream, visible through the bridge, the two white geese's heads were in the water. A few seconds into the brown goose's screaming, the white geese's necks shot straight up in rapid succession. The two birds stopped, listened, then started to squawk and to fly/run down the stream. Mama Goose stepped out of the cage and slipped into the water. By now the other geese were running/flying under the bridge, honking incessantly. Mama swam out to meet her family. They paused midstream, stopped squawking, and silently regarded each other. "I wish we had a video camera," said Nathan. The geese then began what I can only describe as a parade. They swam around the pond, then marched up on the beach in front of my building, the two white geese's heads and necks extended up and out as they trumpeted the brown goose's return. Mama Goose, a little lightheaded perhaps, walked carefully, head bowed beneath her curved neck. The white birds were her honor guard, honking loudly, telling everyone she was back. The geese returned to the water and continued their demonstration. Standing on the third-floor balcony next to mine, my neighbor Rob was on the phone to Miranda, telling her the good news. We exchanged thumbs-up signs. Nathan and I shook hands, and I thanked the girls. Then the NAR people were gone--their work was done. A little later, I took some bread out to my birds. The geese were on the far side of the beach, as were dozens of seagulls. My attempt to serve up bread crumbs quickly led to pandemonium. Mama Goose was listless, getting a scrap or two, but seagulls swooped in, around and under her as she retreated toward the creek. When I approached her, she cried out and eyed me fearfully as she fled. One of the white geese walked over to me and bit my shin. Hard--really hard. I had been nipped by geese before, but never like this. "Ow!" I yelled, and slapped her away. She lowered her head and bit me again. Then the other white goose joined in--charging with neck outstretched my way, hissing fiercely. I threw the bread down in front of them. They ignored it, pressing their attack as I backed away. Meanwhile, Mama Goose swam upstream to safety. The two white geese's behavior was unlike anything I had ever encountered with them before, but just the kind of behavior that typically makes people run away from geese in terror. And, surprised and pained as I was, I really appreciated it. The two geese put themselves at risk to protect their family member who had (evidently) escaped our human clutches after being mauled by a dog. "Hasn't she suffered enough? You leave her alone!" --or so the geese seemed to be screaming as they drove me from the beach. Later that afternoon, I happened to be up in the university woods when the weather reverted. Cannons of thunder, lightning, then marble-size hailstones fell like machine-gun fire through the redwoods. I thought of the birds taking shelter. That evening, back home, I watched my geese huddled on the little beach, their beaks tucked beneath their wings as they settled in to abide Nature's fury. So, anyway, that was why I got so upset when I saw John Kerry killing geese in Ohio to impress undecided voters. Somehow, despite this, I managed to finish writing my list of 50 reasons to vote for him. But John Kerry lost Ohio. He also lost the election. And after many observers had predicted he would win both. Now they're all pondering the big question: What shot Kerry down? Yeah, well, before they're all done analyzing, somebody ought to poll the folks who made up their minds right at the very end that they simply could not vote for John Kerry. And ask those people: "How do you feel about geese?" In recent years, Dr. Tammy Abraham and Melanie Dominguez were among the compassionate professionals who left the clinic mentioned in this story and started Pacific Veterinary Specialists at 1980 41st Ave., Capitola; 831.476.2584; www.pvses.com. Native Animal Rescue carries on as an all-volunteer organization, surviving on donations. Granddaughters Zoe and Lupen have assumed day-to-day responsibility for the program, but Grandmother Molly still answers emergency phone calls around the clock. NAR desperately needs financial help to continue saving injured, sick and orphaned wildlife. Please send contributions to Native Animal Rescue at P.O. Box 1001, Santa Cruz, CA 95061. Aw, come on--it's Christmas! From the December 15-22, 2004 issue of Metro Santa Cruz.